For over 20 years, we've provided expert Piano Tuning, Maintenance and Repair service throughout Chicago and Chicago Land. 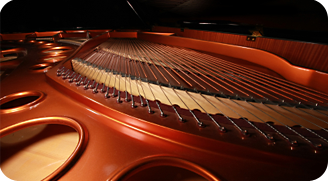 With clients including families, colleges, professional musicians, and recording studios, we've earned a reputation as one of Chicago's leading Piano Tuners. Finding a good piano tuner is just like finding any other skilled professional: whilst qualifications are essential, nothing beats recommendations from satisfied customers! Tuning a piano is essentially the same as tuning your guitar; the difference being that on a guitar you've got six strings to perfect, whereas your average piano has a good 230 strings, each string must be as perfect as possible. While a guitar is tuned almost every time one picks it up to play, a piano tuning must last for a good 6 months. The sound of the 88 piano notes is produced by the 230 strings because the treble strings have 3 strings for each note to add richness of tone and volume, the thicker bass notes only having one or two strings per note. Also, the piano has much greater tension on the strings, adding up to 15 tons on average. That is one of the reasons for a piano to be out of shape with seasonal change. Because most piano parts are made of different types of wood, humidity and temperature fluctuation play a big role in destabilizing tuning and action touch. A440 is a common term among musicians - it means middle A (i.e. A4 on a standard keyboard) has been tuned to 440Hz (i.e. air pressure waves pass a fixed point in space at a frequency of 440/second). This is standard concert piano pitch to which most instruments in the western world are tuned. In 1936, the American Standards Association recommended that the A above middle C be tuned to 440 Hz. Although still not completely universally accepted, since then it has served as the audio frequency reference for the calibration of pianos, violins, and other musical instruments. This pitch is used to tune most concert pianos before any major performance. The average domestic piano, however, is not tuned before every concert, but on average twice a year. For this reason, when a piano hasn't been tuned for several years, it's probably gone flat and it is customary for the tuner to leave it slightly sharp, expecting the piano to settle back into concert pitch over the next few months. For example, if the piano was ¼ semitone below concert pitch, most piano tuners would try and leave it about 3-4 Hz sharp; if the piano was a tone flat then it might be raised even more. But we’re not limited to doing only the tuning part; sometimes, a piano requires action regulating, voicing, or even repair. We can proudly say that we do all that with the highest level of expertease. Why not find out more about us, including what our customers say about our piano tuning and piano repair services. Please browse our Chicago Piano Tuning website and if you still can't find what you're looking for please feel free to contact us with any questions about piano tuning or piano repairs.